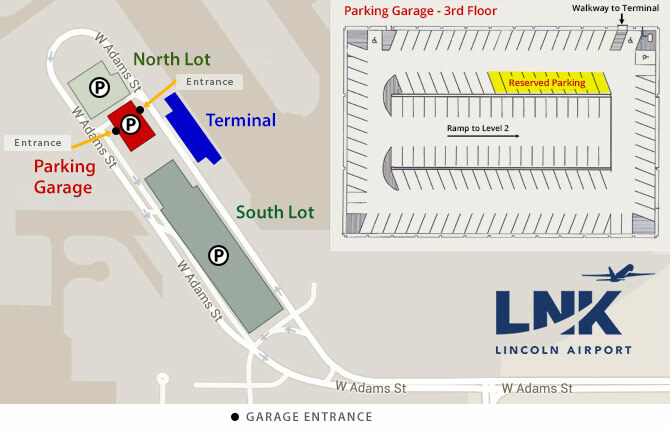 Reserved Parking at Garage: Reserved Parking in the covered parking garage is the most convenient way to park at Lincoln Airport. Located on the 3rd Floor of the Garage, these dedicated spaces are near the covered walkway. Just park and walk to the Terminal! You will need to pay a $3 per day reservation fee online to book a spot and then pay the parking fee ($3 per hour up to 3-hours or $9.50 per day) when you exit the Garage. For your convenience, we accept cash, VISA, MASTERCARD, DISCOVER and AMERICAN EXPRESS. The covered walkway is accessible for customers with physical challenges.